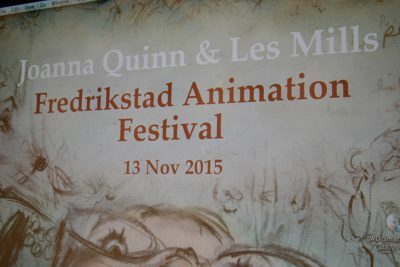 Fredrikstad Animation Festival was held from November 12th to 15th at Fredrikstad Kino and Litteraturhuset in Fredrikstad. The festival had a diverse programme with short film screenings, seminars, exhibitions and more. 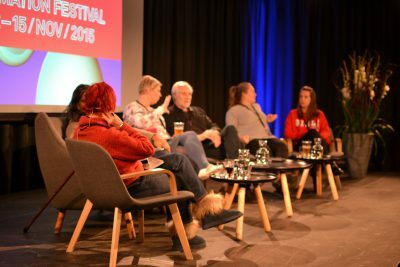 Official guests at the festival were: Richard Williams (UK), Imogen Sutton (UK), Ilja Bereznickas (LIT), Joanna Quinn (UK), Les Mills (UK), Eric Shaw (US), Rebecca Smith (UK), Jonas Odell (SWE), Sunit Parekh-Gaihede (DEN), Metsämarja Aittokoski (FIN), Waltraud Grausgruber (AUST), Alan Holly (IRE), Uzi Geffenblad (SWE), Kristin Ulseth (NO), Mats Grorud (NO), Tine Kluth (UK), Johan Edström (SWE), Dorte Bengtson (DEN), Erin Handgard (NO), Arild Ørnholt (NO), Marius Stene (NO) and Jan Petter Aarskog (NO). 101 films in the categories animated feature films, animated shorts and animated commissioned films were screened during the 2015 festival. 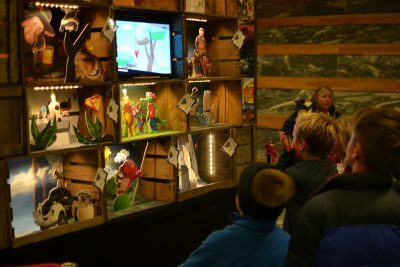 The festival’s main programme was the competition programme for animated short films from the Nordic and Baltic countries. A central part of the festival is the competition programme for Nordic-Baltic animated short films and the Golden Gunnar Award. Out of 139 submissions, 19 professional short films were selected to compete, divided into two short film programmes, in addition to 15 student films, 27 commissioned films and 9 children’s films in their own programmes. The professional short film and commissioned film jury consisted of Håvard Strand, Frank Mosvold and Camilla Selvon Abrahams. 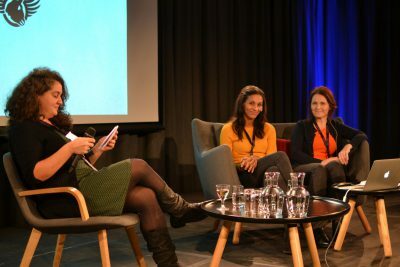 The student film jury consisted of Anita Killi, Kajsa Næss and Regina Pessoa. Bereznickas is a key figure in the Nordic and Baltic animation scene, and his career spans over four decades, including work for an animated feature in Norway during the nineties. His filmography includes several animated short films and he is an acclaimed teacher and drawing artist. Ilja Bereznickas has a degree in architecture from Kaunas Polytechnic Institute and Postgraduate School of Scriptwriters and Film Directors in Moscow, Russia. Since 1985, he has been working at the National Lithuanian Film Studio – as director, artist and animator. In 2002 he initiated and became the Head of the Animation Programme at Vilnius Academy of Art as part of the Photography and Media Art Faculty. He has also taught animation in Israel, Norway and Lithuania. 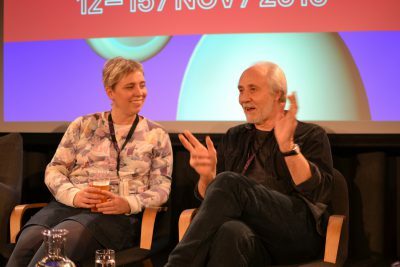 The festival board of Fredrikstad Animation Festival honours Ilja Bereznickas with a retrospective programme and an exhibition during the festival. This movie is subtle and has an amazing humour. The design and animation has a distinct style and good timing, and the film gives an insightful description of the rich dynamics in a difficult relationship, also with the use of winning humour. In addition, Machine by Sunit Parekh-Gaihede honorable mention. This student film is very professionally done. The filmmakers show a great talent for storytelling and combines characters, story and designed in a stylish and entertaining way. Tsunami by Sofie Kamp Mark was awarded an honorable mention by the jury. Jury: Brage Odin Bull-Hansen (8), Agnes Ticket (7), Mikkel Hurrød Nilsen (10), Amanda Soderberg Jansen (7) and Madelen Rimehaug (8), all from Fredrikstad. We like stories about good vs. evil. This year’s best children’s film is also funny. It ‘s cool that a little bird can achieve something big. By using good design to illuminate a difficult subject and to tell the story through animated metaphors, the filmmakers created gorgeous artwork and a mouthpiece for an important message. Amnesty by Andreas J. Riiser received an honorable mention by the jury. The Audience Award was selected by the festival’s audience. Three special screenings dedicated to a person or theme was also presented. 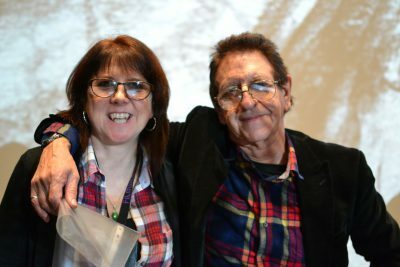 These screenings included interviews with filmmakers and curators. 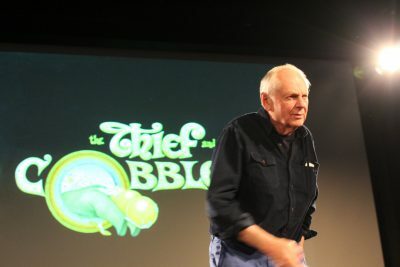 Programme dedicated to two masterpieces by director and animator Richard Williams, with subsequent conversation about the animation, films and career of Richard Williams. 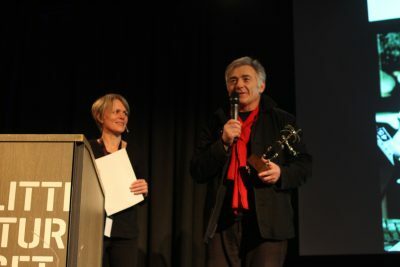 The festival’s Lifetime Achivement Award winner Ilja Bereznickas was honoured with a retrospective programme devoted to his life and work. 6 short films from the 80s to today were presented in the programme. 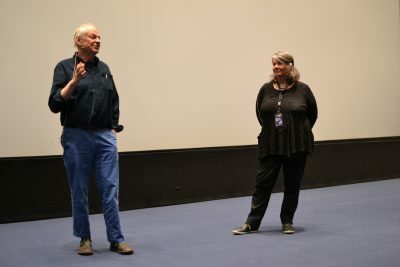 Ilja Bereznickas was present and held an introduction, and was interviewed after the screening. Special programme curated by Waltraud Grausgruber, one of the festival leaders from the Tricky Women Festival in Austria, the world’s oldest animation festival for films exclusively made by women. 8 films made by female directors were screened in this programme. An introduction about the festival’s exchange programme was presented. 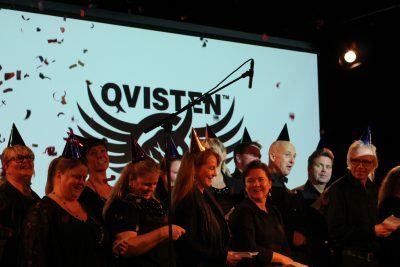 Retrospective programme dedicated the 20th anniversary of animation studio Qvisten. 7 short films, all produced by the studio. The six finalists for the Cartoon d’Or, a pan-European animation award for short films. 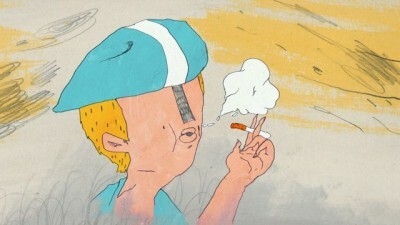 Fredrikstad Animation Festival is one of ten European festivals wh nominated films for the award. The industry seminars contained two lectures on how the animation media can best be used for storytelling. The first lecture was devoted to Joanna Quinn’s and Les Mills’ work as freelance filmmakers and their animation company Berly Productions. The second lecture was about screenwriting for TV series, where we presented the acclaimed and award-winning writer Eric Shaw, known from the TV series SpongeBob SquarePants. Award-winning British animators Joanna Quinn and Les Mills have been in the animation and film industry for over 30 years. In 1987 they created the animation production company Beryl Productions International. They have produced a number of commercials for the North American and European markets some of which they presented during Friday’s seminar. 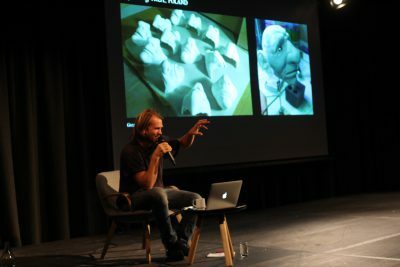 During Fredrikstad Animation Festival the audience got an insight into their academic background and work processes, it also focused on their artistic expression as makers of short films. Eric Shaw is a former writer for the success series SpongeBob SquarePants, and has won an Emmy for “Outstanding Writing in Animation” in 2013 for the work he did on the critically acclaimed NBC series Word Girl. During the lecture in Fredrikstad Shaw held a lecture on the creation of the heart, mind and soul of a television character. Eric also gave an insight into the production process from an idea to the final screenplay. 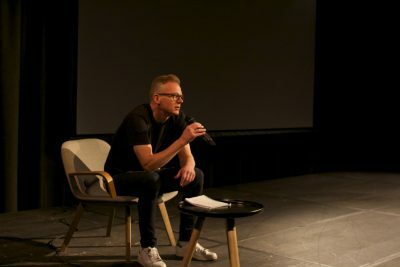 Much of Saturday’s programme was dedicated to focus on the Nordic industry, participants from Denmark, Finland, Norway and Sweden held presentations at Litteraturhuset in Fredrikstad. Five selected studios showed their showreel and four filmmakers, one from each country, held presentations of their projects and work. The forum was a collaborative effort with animation organizations from other Nordic countries: Danish ANIS, Swedish SAAVA and Finnish Finnanimation, in addition to the festival organization Norwegian Animation Forum. Norwegian Mats Grorud is a director and animator with several award-winning short films. He presented his work in progress feature film The Tower. Jonas Odell is an award winning director from Sweden who is perhaps best known for his music videos and short films. Odell is the co-establisher of “Filmtecknarna”, which was one of Sweden’s most legendary studios for animation. 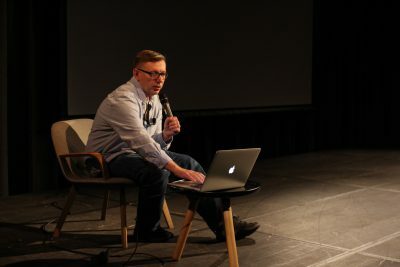 Jonas Odell focused on storytelling in animation and presented his longtime career during Nordic Animation Forum. Sunit Parekh-Gaihede lives and works in Denmark, and has more than fifteen years of experience in animation and visual effects from three continents. In 2006 he established the studio Hydralab, a multimedia studio specializing in animation and visual effects. 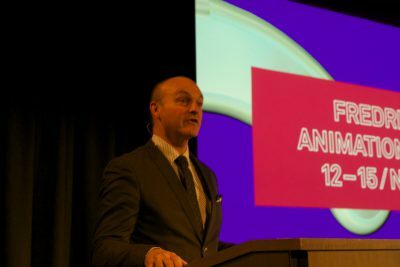 During the Nordic Animation Forum he presented the studio’s many projects. Metsämarja Aittokoski is a children’s writer, director, screenwriter and producer. She has directed several popular children’s series like Pikkuli, Respect!, Fire Fairy and Leffatuutti Zurbaani. 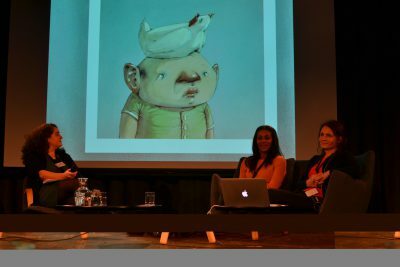 During the Nordic Animation Forum she focused her presentation on her TV series Pikkuli. Multimedia artist Rebecca Smith lives in East Midlands, United Kingdom. In 2005 Rebecca founded Urban Projections, a creative collective of experimental multimedia artists who specialize in delivering innovative performance opportunities and creative projects for both artistic and commercial production. The festival kick started Thursday morning with a breakfast seminar at Hydrogenfabrikken in Fredrikstad, with lectures where Rebecca Smith spoke about their projects for the creative industry. For the fourth consecutive year Fredrikstad Animation Festival, in cooperation with Viken Filmsenter, held a seminar for media classes from upper secondary schools in Østfold. 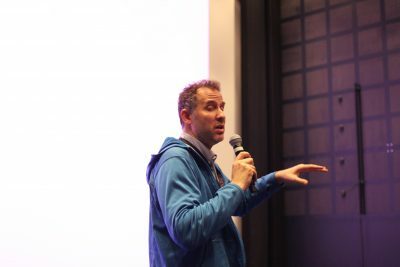 165 students attended two lectures by writer Eric Shaw and the animators behind internet hit Norwegian Vegetables. A 50-minute program of short films composed of films from the festival’s short film programmes was also presented. Illustrator Lisa Aisato gave a presentation on her upcoming short film Odd is an Egg, which is scheduled to premiere in 2016. Odd is an Egg will be an adaptation of Lisa Aisato’a own book, with Kristin Ulseth as the director and Aisato as production designer. Øystein Dolmen and Eric Vogel followed with a presentation of the feature film Knutsen & Ludvigsen og den fæle Rasputin. Øystein Dolmen (also known as Knutsen) is the ideaman behind the film, while Eric Vogel is the film’s producer. 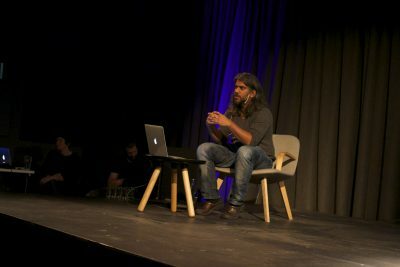 Together they held a presentation of the film’s development from Dolmen’s (and partner Gustav Lorentsen) ideas, from sketches to a 3D universe. A conversation between filmmakers from the festival competition programme for animated short films, moderated by animation blogger and journalist Nancy Denney Phelps (Belgium/USA). 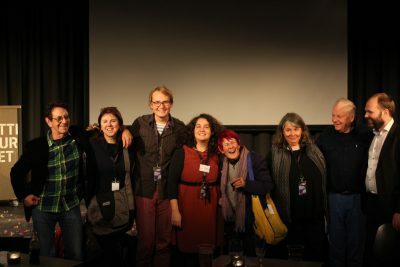 Filmmakers who ware present at the session were: Lise Fearnley, Thor Sivertsen, Sunit Parekh-Gaihede, Hanne Berkaak, Kajsa Næss and Dorte Bengtson. 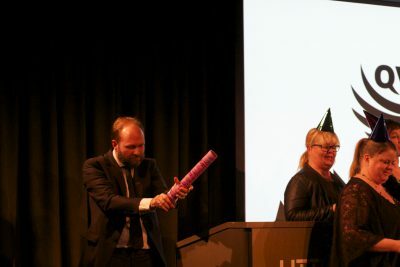 Official opening of the festival with speeches by Andreas Lervik, Chairman of Norwegian Animation Forum Trine Vallevik Håbjørg and Festival Director Anders Narverud Moen. 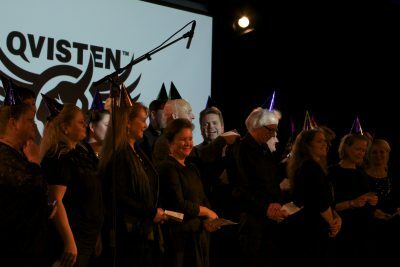 The local choir Båthuskoret entertained, as well as two films of the festival’s official guests; Britannia by Joanna Quinn and Newspaper Man by Ilja Bereznickas. 24 illustrations and drawings by Ilja Bereznickas, was exhibited at Litteraturhuset in Fredrikstad. The pictures were a variety of work Bereznickas has made over four decades as an illustrator and filmmaker. The exhibition also contained storyboards and sketches from Bereznickas’ films. The selection of the displayed images were made by the festival administration with Festival Director Anders Narverud Moen in charge. Selection work was done in collaboration with the artist. The exhibition was free and available in the festival period from November 12th to 14th. A reception for the exhibition was organized ahead of the festival’s opening ceremony on Thursday November 12th, 200 people were present at the opening. A three-dimensional time travel in the form of 21 potato boxes all of which provide a glimpse into Qvisten Studio’s history, for their 20th anniversary which was celebrated during the festival. Opening reception of the exhibition took place on Thursday November 12th. 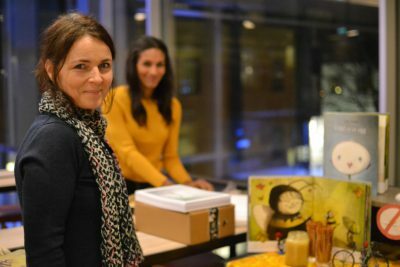 In cooperation with Fredrikstad Kino and E6 Media Workshop, a film programme and family activities were offered at Fredrikstad Kino Saturday November 14th. A free animation workshop, drawing workshop and lego building were some of the activities children and their families could attend. The film programme consisted of a free short film programme for children, as well as three animated feature films. Lisa Aisato, from Kråkerøy, Fredrikstad, read aloud from her book Odd is an Egg. She also showed the process of making an animated film of the book. Fredrikstad Animation Festival is run by Norwegian Animation Forum, with Anders Narverud Moen, CEO and Festival Director. Marita Mayer was responsible for the seminars, and Therese Øvergård as festival coordinator. Amandus Festival in Lillehammer, AnimationVolda, Arena Magica, The Austrian Embassy in Oslo, E6 – Østfold Media Workshop, Film og Kino, Frame by Frame, Fritt Ord, Fredrikstad Kino, Fredrikstad Kommune, Hydrogenfabrikken, KarivoldFilm, Litteraturhuset in Fredrikstad, Nebbelux, Netron , Norwegian Film Institute, Qulthus, Scandic City Hotel, Viken Filmsenter, Østfold County and Østfold cultural productions.